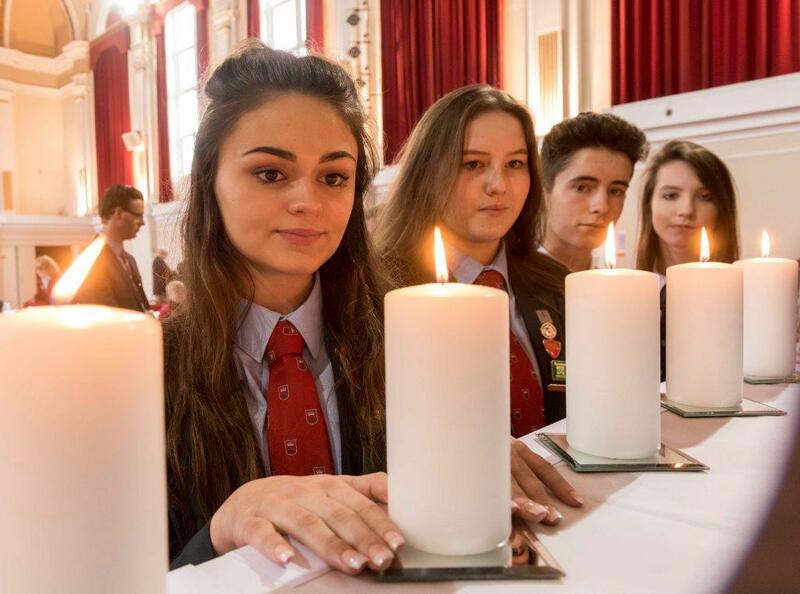 Every January, hundreds of schools across the UK mark Holocaust Memorial Day with a range of activities, including displays, assemblies, lessons, talks, trips, performances, concerts, art projects, community events, candle lightings, tree plantings, and many other creative ideas. You can order or download a free poster pack here. More images, poems and life stories of real people’s experiences are also available in our resources hub. If you have a bit more time, your students could create their own display based on a life story they have read, or write their own poems. Lighting candles or laying stones are traditional ways of remembering those who were murdered, and reflecting on the messages of the day. This could be combined with poetry readings, prayers, songs or a film screening. Visit our resources hub to find materials. HMDT provides assembly scripts and presentations that can be delivered as provided, or added to with student contributions or performances. Different assemblies are provided for primary and secondary schools, and are suitable for all year groups from Key Stage 2 (or equivalent) and above. Download these here. The Postcard Project for Holocaust Memorial Day 2019 explores the theme: Torn from home. Students will learn the life stories of survivors who were forced to flee their homes during the Holocaust and the Genocide in Cambodia, and write a message to them. Full lesson plans are provided for primary and secondary level. By letting us know you have taken part, your class will receive a reply message from these survivors. Struggling to find curriculum time to mark the day? We have provided a bundle of five interactive activities that can be delivered in Tutor Times, to give students an introduction to the genocides marked on Holocaust Memorial Day through discussing images, quotes and video clips. You can find all the free teaching resources provided at www.hmd.org.uk/education. If you have any questions, please feel free to contact us on [email protected]uk.